One common question I get asked a lot is, “Can you fix this tile?” My answer is usually, “It depends.” In some of those cases the client has some spare tiles or knows what type of tile was used and fortunately that tile is still available. This is more common when common natural stone tile is used…slate can be matched well enough due to the piece by piece variation. Travertine is also one stone that can be found fairly readily and is timeless in its appeal. What happens more often though is the tile in question is old ceramic from a decade or two ago and getting a match will be impossible. For some repairs the client is looking for quick and simple tile repair rather than a complete tear out and full replacement. One of my “work-around” suggestions is a tile rug. Depending on the location these types of repairs will need to follow what is going to make the project look decent and not require tons of extra work. In the above example a few tiles were broken right inside this entry door. The owner was looking for a simple repair prior to getting the home listed with her realtor. The original tile was set with some really wide grout lines so a simple match with a tile of the same size would have looked a bit goofy. By introducing some extremes in contrast or pattern the repair can almost look like it was planned from the beginning. By bordering the repair and laying some tiles on point a pleasing pattern was used with a minimal amount of material. As a tile contractor in Denver, I have a handful of odd scraps of tile kicking about in my shed, that and a number of partial bags of grout. These are very handy for projects like this. I have done lots of repairs from my own inventory but in this case I needed a few more pieces. Some of my specialty suppliers will often get returns or have some odd remnant boxes in their back store rooms. They are more than happy to make these go away. For this project I picked up two different odd lots of tile for less than $10. Some time at the wet saw had me fine tuning the pattern to fit into this repair area. 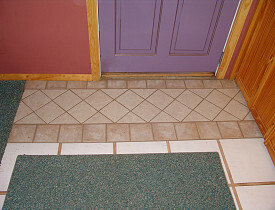 Once the old tile was removed the install went quickly and before long this home was showing off a little custom work. With the broken tiles out of the picture, the realtor was more than happy to showcase this home.